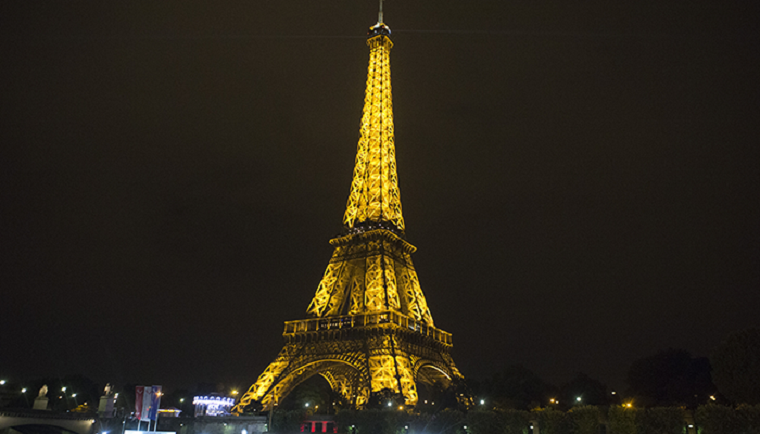 The Eiffel Tower has been fitted with wind turbines from a New York City-based company as part of a $40 million renovation marking the iconic structure’s 125th birthday. Urban Green Energy, which specializes in vertical axis wind turbines, installed two of their turbines 400 feet above ground level as part of a larger energy-efficiency retrofit for the Parisian tower. The two turbines, each 5.2 meters tall, are expected to produce 10,000 kilowatt hours a year. The turbine design is not the typical windmill variety that spins when wind is coming from a specific direction. Rather, three curved blades are mounted vertically and are engineered to catch wind currents coming from any direction. The design is tailored to urban environments where space is at a premium and strong winds can be scarce. “It’s great for us to be able to display these technologies at such a high-profile site,” said Jan Gromadzki, an engineer at U.G.E. and the project manager for the Eiffel Tower turbines. Because of the tower’s age and design, cranes are not allowed, which presented an installation challenge. The turbines were painted brown to match the rest of the tower. U.G.E., which has offices in Midtown as well as in Beijing, has installed or is in the process of installing turbines at six schools around the city and Westchester, and at least three residential buildings.